With the Food Movement Profiles series, we support and highlight the work of Food Secure Canada members across the country. Our amazing members work daily to strengthen the food movement and create more just, healthy and sustainable food systems. As a pan-Canadian alliance of organizations and individuals, we are working together to advance food security and food sovereignty. 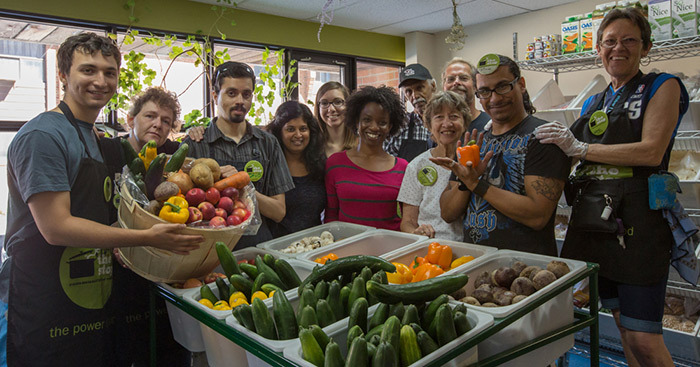 Today we are pleased to interview The Stop Community Food Centre, based in Toronto. Below, we discuss their great work, local food, food policy and their participation in Resetting the Table, the next FSC National Assembly. Food Secure Canada (FSC): Tell us about The Stop’s mission and history. The Stop: For over 30 years, The Stop Community Food Centre has been at the forefront of dignified, innovative programs that use food as a tool to build community and create change: providing access to healthy food; building skills, health, hope, and community; and confronting the underlying issues that lead to poverty and hunger. The Stop’s wide range of programs include drop-in meals; a food bank; community kitchens, gardens, and markets; perinatal and family support; peer support and civic engagement; and children and youth education. We strive to increase access to healthy food in a manner that maintains dignity, builds health and community, and challenges inequality. FSC: We hear a lot about healthy and sustainable food nowadays. What’s The Stop’s definition of “good food”? The Stop: The Stop believes that food is a basic human right – not just any food, but good food – fresh, nutritious, and nourishing food. This belief is reflected in all the food we make, serve, grow, and distribute. The Stop’s Healthy Food Philosophy recognizes food as an essential part of life, necessary to maintain the good health of body, mind, and spirit. We also know that food plays an important part in the cultural diversity of our community, and work to meet those needs through our programming. In this process, we nurture community through a shared food experience. 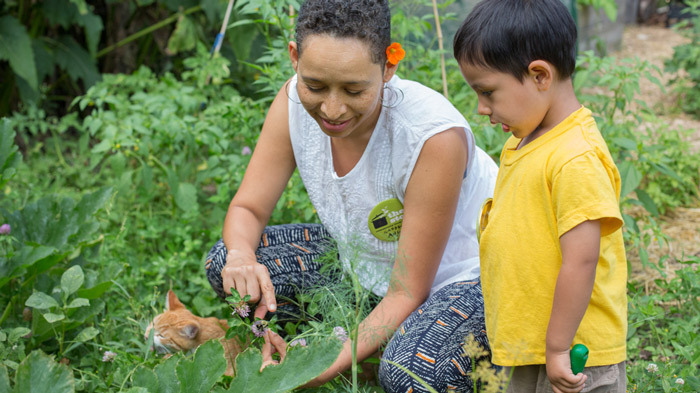 We respect the health of the Earth and its complex ecosystems, prioritizing organic gardening, local, seasonal, and culturally-diverse food, and growing practices that value traditional knowledge. FSC: Can you describe how The Stop helps to build the food movement? The Stop: We believe we can be part of building a sustainable food system that produces good food and generates healthy livelihoods, and engage in a number of activities to support this goal. We strive to use our purchasing power to support local, sustainable food producers, thereby helping to keep pesticides out of our water, reduce greenhouse gases going into our air, and support good jobs in our communities. The results are homemade meals and food hampers featuring fresh, local, seasonal, and sustainably-produced ingredients and products. Incorporating good food requires investment, and that means raising and targeting funds towards growing it and buying it, developing relationships with socially and ecologically conscious food suppliers to source it, and passionate chefs to prepare it. We source local and culturally relevant seed stock, and teach growing practices that align with our food purchasing and preparing ethic. 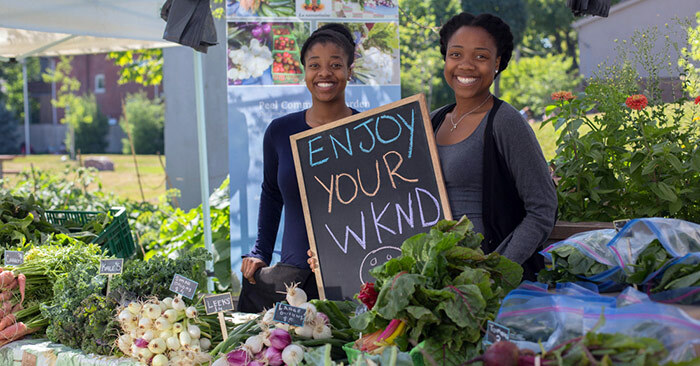 Our weekly Farmers’ Market is another way we support our local food movement. Open year-round, our market provides local famers and vendors with a popular market venue that sees several thousand visitors every week. The Stop’s Farmers’ Market generates approximately $2 million a year in sales for the farmers and vendors at our market. The Stop has long been a member of the Toronto Food Policy Council, and last year our Executive Director Rachel Gray took over as Chair. The Council’s work has recently included a food asset mapping initiative that has engaged hundreds of Torontonians as local “food champions” trying to grow our communities' and City Councillors’ understanding of the critical role of food in the health and well-being of our city. We know that hunger has become a predictable reality for people living on social assistance, low incomes, and in poverty – a “new normal” that jeopardizes the health and well-being of families and entire communities. More than 30 years since the first food bank opened its doors, Canadians are continuing to go hungry because charity is not the answer to grinding poverty. The Stop has been at the forefront of this message for decades, and continues to mobilize others in recognizing the intersections of income, food, and health. The Stop acknowledges unequal access to food due to the inequalities enforced by living in poverty. By taking steps to be a more inclusive organization and to reflect that in all that we do, The Stop is working towards food justice for all. FSC: How can we get involved with The Stop? The Stop: The Stop always welcomes new supporters! 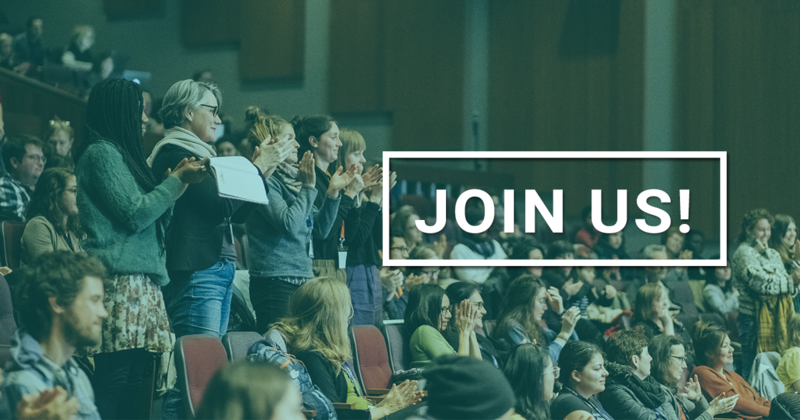 You can donate to help us deliver our critical programming, volunteer in our programs or at our events, or stay informed about our work and the issues. You can also join us at one of our popular fundraising events, or visit our weekly Farmers’ Market at Wychwood Barns. FSC: The Stop is an organizational member of Food Secure Canda. We work together for deep and lasting change in our food system. How does The Stop see national food policy? Will it help you achieve your mission? The Stop: We believe in the importance of a national food policy because Canada currently lacks any sense of a coherent vision in regards to food access and the food system. A national food policy must address food insecurity through inadequate social assistances rates, low minimum wages, and skyrocketing housing costs, in addition to our unsustainable food system, in order to ensure that all Canadians are able to meet their basic needs. FSC: What events and/or sessions The Stop is organizing as part of the FSC National Assembly in October and what do you hope to achieve? The Stop: The Stop is proud to welcome delegates from across the country to Toronto, and will host tour(s) of our programs at both of our locations. Some of our staff will be participating in workshops and plenaries, and we are also collaborating with FoodShare on a workshop that will enable community members to explore the intersection of race and food insecurity through arts-based practice. The Stop will be part of Resetting the Table, Food Secure Canada’s 9th Assembly (Toronto - October 13-16, 2016).